Beginning at the split of U.S. 29-52-70 and Business Loop I-85 from Interstate 85 (Exit 87) near Davidson County Airport (EXX), I-285 initially travels northeast toward Lexington. Business Loop I-85, U.S. 29 & 70 depart for Downtown while I-285 and U.S. 52 continue around Lexington, bypassing it to the west. The freeway proceeds north around both Welcome and Midway before entering Forsyth County. I-285 ends at the exchange with I-40 while the U.S. 52 freeway continues into Winston-Salem. 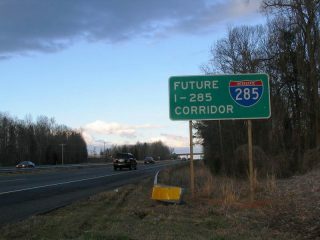 Future Interstate 285 Corridor signs appeared on the U.S. 52 freeway in early 2006. This entry was photographed by Carter Buchanan on January 28, 2006 near the city of Lexington. Already built to Interstate standards, the section of U.S. 52 between Lexington and Winston-Salem was initially submitted to the American Association of State Highway and Transportation Officials (AASHTO) as Interstate 185. That designation however, was rejected on May 30, 2003 during their annual Special Committee on Route Numbering meeting. Interstate 285 first appeared in North Carolina’s Strategic Highway Corridors map as of November 12, 2004. Cassell Street spans Interstate 285 & U.S. 52 on the half mile approach to the full cloverleaf interchange (Exits 107A/B) with Interstate 40. Photo taken 12/15/16. Exit 107A departs for I-40 east to Greensboro and U.S. 311 south along side I-74 east to High Point. Photo taken 12/15/16. A loop ramp (Exit 107B) follows from U.S. 52 north for I-40 west to Statesville and Asheville. I-285 north ends as U.S. 52 continues north to Downtown Winston-Salem and Mount Airy. Photo taken 12/15/16. Exit 193A loops away from Interstate 40 west for I-285, U.S. 52 & N.C. 8 south to Lexington. N.C. 8 overlays the freeway south to Bethesda. Photo taken 12/15/16. Sign changes made along Interstate 85 north during freeway expansion removal most references from Business Loop I-85 for Exit 87 to Lexington. Additional sign changes will be needed in 2018 with the approval of I-285 north. Photo taken 12/15/16. U.S. 29-52-70 split with Interstate 85 north at a wye interchange (Exit 87). The three routes accompany I-285 and Business Loop I-85 through southwest Lexington. Photo taken 12/15/16. “U.S. 52 gets a second name.” The Winston-Salem Journal, September 10, 2005. I-285 Gets Federal Approval as the Next New Interstate for North Carolina, NCDOT News Releases, February 15, 2018. Page updated February 18, 2018.